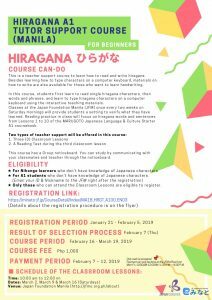 This is a teacher support course to learn how to read and write hiragana. Besides learning how to type characters on a computer keyboard, materials on how to write are also available for those who want to learn handwriting. In this course, students first learn to read single hiragana characters, then words and phrases, and learn to type hiragana characters on a computer keyboard using the interactive teaching materials. Classes at the Japan Foundation Manila (JFM) once every two weeks on Saturday mornings will provide students a setting to verify what they have learned. Reading practice in class will focus on hiragana words and sentences from Lessons 1 to 10 of the MARUGOTO Japanese Language & Culture Starter A1 course book. This course has a Group noticeboard. You can study by communicating with your classmates and teacher through the noticeboard. ★ Only those who can attend the Classroom Lessons are eligible to register. This is a course where participating students are determined by a select ion process. For those who wish to apply, please read the course out line carefully. 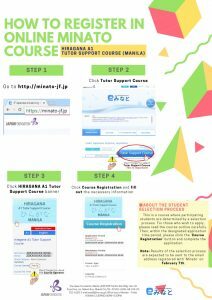 Then, within the designated application time period, please click the ‘Course Registration button and complete the application. Results of the selection process are expected to be sent to the email address registered with ‘Minato’ on February 7th.